The EfD in Central America is an integral part of the thematic Research Program in Economics and Environment for Development (EEfD) of the Tropical Agricultural Research and Higher Education Center (CATIE, by its Spanish acronym)1. EEfD fosters the encouragement of environmental and economic conditions in the Central American region by improving policy design and increasing the impact of research activities through their alignment with national and regional policy needs. To achieve these regional objectives, the present Strategic Research Agenda on Environment for Development identifies the environmental policy areas that might benefit the most from EEfD research activities2 and more generally from research conducted by partners in the region. 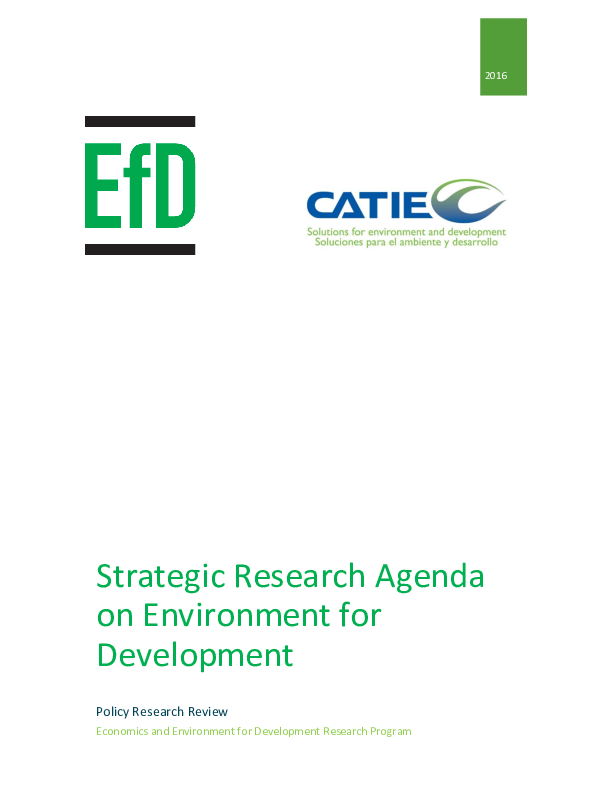 This Strategic Research Agenda on Environment for Development seeks to assess the relevance of past and current EfD research on the policy discussions in Central America. This document also identifies areas where the center will direct its research efforts in the future in order to contribute to the policy debate and increase its impact in issues related to development and environment. Finally, this Strategic Research Agenda is also a call for collaboration and partnership with other researchers in the Central American region.